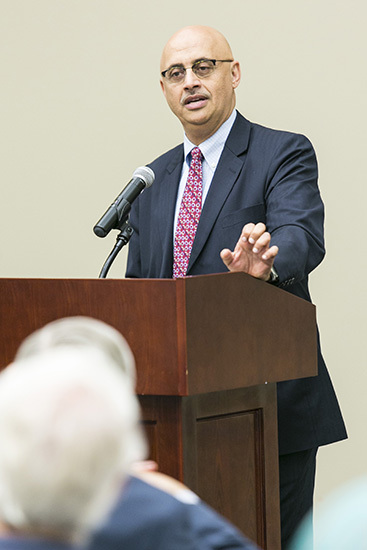 Middle East expert Abdulwahab Alkebsi traced the founding of Islam to explain the history and political reasons for the rise of Islamic extremism in a talk at Samford University Sept. 3. Alkebsi is regional director for Middle East and African programs at the Center for International Private Enterprise (CIPE) in Washington, District of Columbia. Alkebsi spoke at the inaugural gathering of the Samford University Committee on Foreign Relations, in conjunction with the Birmingham Committee on Foreign Relations. The new initiative is a collaboration of the Birmingham group and a Samford committee led by assistant to the president Michael Morgan, political science associate professor Serena Simoni, associate provost Christopher Metress and others. Its goal is to provide opportunities for members to hear experts in the field and to provide events on campus and in the larger community to enhance the understating of foreign relations. Alkebsi noted that the history of Islam reflected a struggle between the establishment and those who would seek to challenge or change it. The struggle for leadership in the next millennium was one of revolutions against corruption, nepotism and civil war, including the first religious extremists but eventually led to the “Shia Quietism,” or Sunni-style rule, for 1,300 years. Alkebsi suggested that four major events took place in 1979 that led to the current political malaise: Islam revolution in Iran led by Khomeini; Soviet-backed South Yemen vs. Western-backed North Yemen; Seizure of Grand Mosque in Mecca by Sunni-Wahhabi extremists; and the Soviet invasion of Afghanistan. During this period, tolerance was replaced by extremism. Alkebsi noted that Al Qaeda and ISIS are this generation of youth that were raised in an environment specifically designed to combat secularism, communism and Shiism. “Not a far jump to fight secular western infidels…,” he concluded. Since its inception in 1943, the Birmingham Committee on Foreign Relations has been the leading international study group in Alabama.